Attack of the MOTHER 3 Plushies! 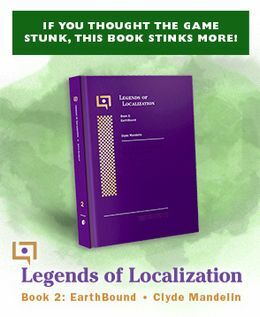 EarthBound fans get better and better at making the series their own! 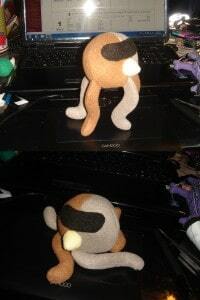 Here are some handmade plushes from a couple of the plushie-making experts at Starmen.Net. 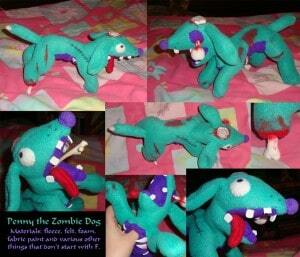 So, here’s Penny the zombie dog plush! Her name is short for penicillin because she’s a bit mouldy. Hey, that’s two fungus-related dogs I have now. Anyway, I managed to make her chest seem a bit more hollow by making a kind of little pocket at the bottom and sticking the ribs out. The top part of her chest cavity is actually connected to her mouth, so she can swallow small objects such as pencils, beads and rabbit bones. She also has a chewed-off foot, since I wondered about making a detachable velcro foot but decided it would be too much extra mucking about. Also she’s got a crinkly brain made by gathering up a bit of grey fleece with very long stitches. I think that’s all I’ve got to say! 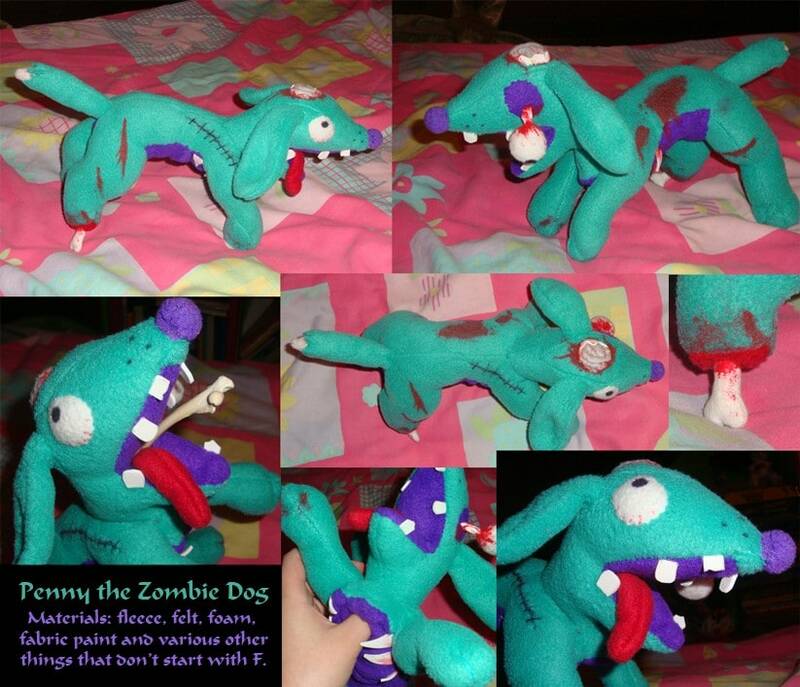 Uuuh I’ve got a few more plushie-type beasts here, nothing too impressive this time. First up is a Kangashark! 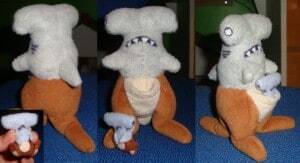 I was going to make the whole thing from scratch but I didn’t have enough of any kind of brown fabric for the kanga part so I sacrificed a Beanie Baby instead. The mummy one is called Lucy and the baby is Luke. 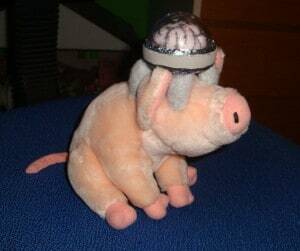 Next is a perfectly normal pig with an extra brain in a jar on its head. I was planning to do this for a while. The brain jar is mostly glued together. 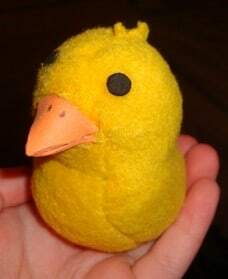 Next next is a bird. The Ultimate Chimera’s BFF kind. I named it Blobby Custard. 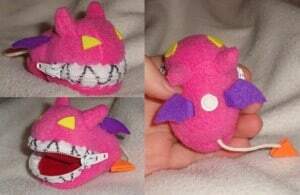 Next next next is a little zip-mouthed footless Chimera purse type thing, because I just wanted to try sewing a zip onto something. I’ll probably sell a couple of these at some point. He can sorta stand, but I couldn’t get his legs at a consistent angle and length. His legs also get in the way of making him perfectly round, otherwise I would’ve proposed him as a Fangamer plushie. I like him better with his legs collapsed like the second picture. None of these cool plushes are for sale, but who knows, maybe if you put a tooth under your pillow at night something nice will show up the next morning! 13 Comments to Attack of the MOTHER 3 Plushies! That zipper chimera is a good idea! Man, these plushies look awesome!! wow just look at that octobot!!! and also hey mato why is your name mato is it your real name??? C’mon people, let us keep it a secret to all the noobs! AWESOME I WANT ALL OF THEM!!!! All I got was a stupid quarter…..NOT ENOUGH MONEY!!!! Eyes5 your octobot reminds me of a Squiddle. Wow, these are all excellently made! I like that UC a lot, it puts a cute light on a big scary creature and the zipper is a really cool idea. oh my pork that UC pluchie is ssoo cute! i luv the zipper mouth i would kill for it! If i had to choose one to get, i would choose the Ultimate Chimera’s Bird.